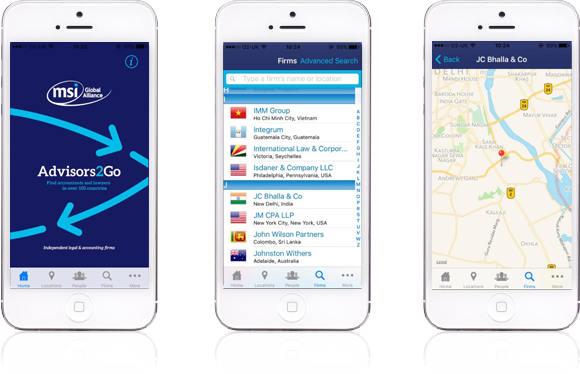 Download Advisors2Go, our association directory app for iPhone and Android. Advisors2Go is the directory app of MSI Global Alliance. If you are looking for expert guidance to help you achieve your international goals, MSI member firms can provide all the support you need, wherever you choose to do business. MSI’s mobile directory app enables you to quickly find and contact accountants, auditors, tax advisors and lawyers of MSI member firms worldwide. You can download the app from iTunes (Apple devices) and Google Play (Android devices).